The operating systems of Windows 8 and 10 are more prevalently used and the popularity of Windows7 has taken a backseat in the market share. If you enjoy watching your favorite movies on your personal computer, then you can play those with different video players, regardless of which window is installed in your system. However, the backup of these DVDs is desirable for convenient uses in the future. You can transfer the DVD videos to Android, iPad and iPhone formats using free software. One such software is the Handbrake which is suitable for ripping of non-encrypted commercial disks. On the negative side, this software is not appropriate for Windows 8 or 10 due to its complex manual setting and inability to rip copy protected DVD files. Check out How to FreeRip DVD to Windows with Handbrake or WinX DVD Ripper from below. We guess that the shortcoming of Handbrake has left you perplexed and increased your dilemma regarding which software to purchase for your windows version. If your system functions on Windows 7 or 8, you can be unhesitant to opt for the WinX Free DVD Ripper. This article has discussed the steps on how to rip DVDs to Windows using the Handbrake and WinX DVD Ripper. Step1. Handbrake rip DVD can be obtained in the best format if the application installed on Windows 10, 64 bits. You can avail this free software if the DVD that you wish to rip is in non-protected and non-encrypted form. After downloading and installation, search for the video which is to be converted. Another important point to be borne in mind is that Handbrake is able to rip the DVDs which can be played in a player only. In case, your disk is stuffed with files like MPG, AVI, MOV, and WMV, these cannot be converted. Step2. The next step is to insert the DVD and open Handbrake application. The scanning process of this software is time taking, you are hence required to keep your patience intact. After the scanning various titles appear, among which you have got to select the title from the drop-down menu. Step3. Handbrake allows converting DVD to MP4 or MKV output format. While selecting the preset, go for 720 x 576 for the PAL DVDs and 720 x 480 in case of NTSC DVDs. Step4. Search for the Save As options and proceed to click on the “Browse” button for selecting the storage location. Handbrake will let you save the ripped DVD in the system’s hardware. You can derive the major merits in using of Free WinX DVD Ripper and these are CSS encryptions, APS, Sony ArccOS and UOPs. Its conversion from DVD to several other formats takes place in a matter of minutes without compromising with the visual quality. This software has been developed with an advanced Hyper-threading technology and Engine of High Quality. The convenient usage procedure entailed in WinX DVD Ripper makes it popular software among the beginners in the handling of converting software. Step1. Insert any kind of DVD in the player for its digitalization to windows. Its highest ripping speed and easy usage procedure make WinX, the best DVD Ripper that is compatible with all the three windows versions of 7/8/10. Then you have to click on “DVD Disc” option for importing the video on DVD. Step2. Proceed on to choosing the desired video format. While using the WinX DVD Ripper, you can choose the target output format from ample choices provided by the software. However, the free edition of this ripper software enables conversion to WMV, MPEG, MP3 and MP4 formats. If you want to expand the conversion options to include MTS, AVI and M4V, download the platinum edition of WinX Ripper. Note: In order to expedite the DVD ripping to Windows 8, opting for MPEG output format is suggested. It can convert the entire movie in a DVD into a MPEG in just five minutes. Step3. On selecting the output option, you have to click on the “Run” for starting off the ripping process to the Windows’ hard drives at the fullest potential accelerated speed. Both Handbrake software and free WinX DVD Ripper lack the capability of supporting the commercial DVDs protected and encrypted with complex Disney DRM. Therefore, for mitigating this accessibility crisis you can certainly download the upgraded platinum version of WinX software. It has been designed in a fashion that facilitates ripping of both commercial and homemade DVDs into diverse output formats. To know more about the exciting features pertaining to the best DVD Ripper in the platinum edition, download this edition at a discounted price and for giveaways check WinX DVD Website. 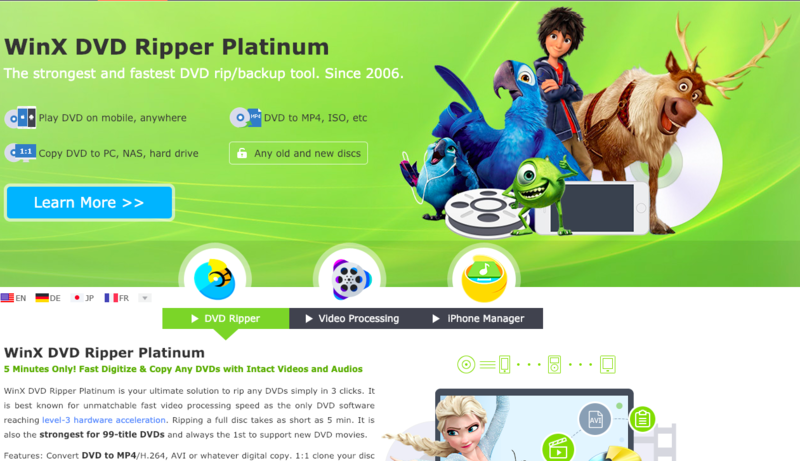 Although various video output formats are supported by Free WinX DVD Ripper, its platinum edition is ultimate for ripping latest and complex DVDs to windows. It is further syncs in well with all the three versions of Windows. Furthermore, the WinX platinum can rip a DVD in just nine minutes at the rate of 355 frames each second and preserving 98 % video quality while consuming file size of 1.24 GB. On the contrary, Handbrake’s ripping potential is restricted till frames of 297 each second. Furthermore, it consumes more than eleven minutes for delivering only seventy percent of video quality and leaving a humungous a file of 6GB. It can be concluded from the above discussion that both WinX and Handbrake are convenient for converting non-protected DVDs to windows. However, for ripping of encrypted commercial DVDs, application of WinX Free DVD Ripper is best alternate solution left for you. Do you want additional advantageous features such as accelerating speed and ripping of latest DVDs? Then ditch both the options and embrace the platinum edition of WinX DVD Ripper.